Umbacano wants you to recover a decorative carving from the High Fane. "I urge you to hand over the carving." After selling Umbacano three Ayleid statues, he'll give you a key and ask you to recover a carving from the High Fane. Find out where the High Fane is (it's now called Malada). Enter Malada and proceed till you find the door unlocked by Umbacano's key. The carving is just inside. On the way out you'll be ambushed by another of Umbacano's treasure hunters. Return the carving to Umbacano for your reward. This quest is only obtained after selling Umbacano the third ancient Ayleid statue in the prior quest, The Collector. 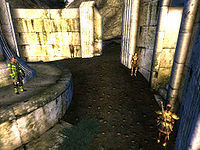 Umbacano tells you that he wants you to recover a special decorative carving from an Ayleid ruin called the High Fane (no apparent relation to the High Fane in the temple of Vivec in Morrowind). This was an important Ayleid structure in the mythic age and, although he does not know its exact location, he has found the key that gives access to where the carving is stored. He believes the ruin is probably known by another name now, shows you a sketch of the Fane, and asks if you recognize it. If you've read the book Cleansing of the Fane, you'll know the modern name of the ruin, and can answer that it is currently called Malada. Umbacano offers to pay you a leveled amount of gold if you can recover the carving. You will also recognize the drawing if you've already been to Malada. Otherwise, when you leave Umbacano Manor, you are approached by a man named Claude Maric. Claude reveals that he is also a treasure hunter employed by Umbacano and that he wishes to speak with you over a drink at the Tiber Septim inn across the plaza. Assuming you haven't read the book, you can ask Claude about the High Fane and he'll point you towards it; he suggests trying a rare book shop, and it turns out it's on the shelf at First Edition. If you raise his disposition high enough, he'll actually tell you the modern name himself. The quest plays out the same if you never talk to Claude (possible if you have previously been to Malada) or if you do not ask Claude about the Fane or Malada. Travel to Malada; it's a long trek into the southeast portion of the province, but there is an unmarked road that leads there straight from Mackamentain, which you may have visited during The Collector. When you get there, you may see a Khajiit named S'razirr wandering outside the ruin. If you increase his disposition to 65 and ask him about "Claude Maric", he will admit that he is working for him, but he does not like him much and will offer to abandon him and help you when he sees an opportunity to do so. In return, you will pay him part of your reward. He will initially ask for a half, but you can choose to negotiate by choosing the "I'll give you twenty percent" dialogue. S'razirr will refuse, but if your Speechcraft skill is greater than 50, he will agree to do it for a quarter. In exchange, he will help defend you in a difficult fight later in the quest, although he will not help you inside the ruin. Whatever you decide, enter the ruin. The carving in question is past a locked door that requires a key. The lock mechanism looks quite unusual, and it is opened by the High Fane Key given to you by Umbacano. 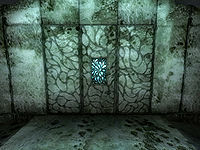 Taking the carving causes the wall to collapse (stand back to avoid taking damage) and reveals the door to the second zone of Malada, Malada Aldmerisel. There is no need to continue into the second zone to complete the quest, though venturing farther will yield a Varla stone and several chests worth of loot. When you exit the ruin, Claude is waiting for you. His greeting is scripted, and he will detect you even if you are sneaking, invisible, or chameleoned. He asks you to turn the carving over to him. If you give him the carving he'll turn and walk off. If you let him keep the carving you'll miss out on the reward given to you by Umbacano, but may still be able to get the third quest. You can of course pickpocket the carving from him as he's walking away. If you give him the carving and attack him quickly enough, just before you deal a killing blow to Claude, he and any other survivors will cease fighting and Claude may be talked to in order to re-obtain the carving. He comments, "I know when I'm beaten! Here, take the carving, if it means so much to you. I had no idea you would take things so personally." They will then leave as usual. If you refuse to give him the carving, he does not attack you as expected. Rather, he orders his three compatriots to kill you, turns invisible, then tries to escape on his horse. His friends come rushing in from hiding places and attack you. This can be a tough fight, but if you chose to accept S'razirr's help, he will aid you by attacking his fellow mercenaries rather than you. Alternatively, if you want to avoid a fight, you can run away. Note that Chameleon is effective against Claude's three friends. You can also kill all three of Claude's employees before you enter the ruin. If you do this, Claude won't even bother showing up. Note however, that this will count as murder and will cause the Dark Brotherhood questline to start. Alternately, just as you step outside the ruin you can cast a frenzy spell that covers enough area to include Maric's henchmen then run for it or duck back into the ruin for a minute. He won't give his little talk and will run off if any of them turn hostile towards him. Once the spell wears off the henchmen become neutral towards you. If you raise his disposition high enough beforehand, Claude may accept a yield. After this, he will run away, his henchmen will kill S'razirr, and you may keep the carving. You can also avoid the encounter entirely by fast traveling as you leave the ruin, before you are spoken to. Once you defeat them, return to the Imperial City and give the carving to Umbacano. He'll pay you the money promised as well as give you a new assignment: the Secrets of the Ayleids quest. If you chose the assistance of S'razirr and he survives the fight outside Malada, you may travel to the Tiber Septim Hotel (next to Umbacano's house) and uphold your end of the bargain. S'razirr will remain at the hotel until you pay him. If you refuse to pay him he will follow you everywhere, and when you leave the city, he will attack you. You will not get the appropriate dialogue options with Umbacano if you purchased the book Cleansing of the Fane instead of finding it, and if you have only read it from your inventory. Drop the book on the ground and read it from there in order to trigger the correct dialogue. If you refuse to give Claude the carving, he will say, "As you wish. Too bad, I was just getting to like you. Kill him." The dialogue assumes that you are playing a male character and uses "him," even if your character is female, unlike most dialogues in the game. 15 In "The Cleansing of the High Fane", the High Fane is identified as the ruin now known as Malada, in the Valus Mountains. I should proceed to Malada and look for the carved panel that Umbacano wants. 20 I have located the ruins of the High Fane, now known as Malada. I need to explore Malada and recover the carved panel that Umbacano wants. 30 I've met a man named Claude Maric, who claims to be another treasure hunter hired by Umbacano. He promised to tell me more over drinks at the Tiber Septim Hotel across the street from Umbacano's house. 33 Claude Maric seems to know where the High Fane is located. Perhaps I can persuade him to tell me what he knows. 35 Claude Maric says that Umbacano has also hired him to retrieve the carving from the High Fane, which Maric identified as Malada in the Valus Mountains. Maric warned me that Malada is very dangerous, and advised that I read "The Cleansing of the Fane" before I go. 45 I met S'razirr at the Tiber Septim Hotel and paid him for his help at Malada. 50 I have found the carving that Umbacano wants. I need to get out of the ruins and return to the Imperial City to deliver it. 54 I was ambushed by Claude Maric outside of Malada. I must escape and return the carving to Umbacano in the Imperial City. 55 I was ambushed by Claude Maric outside of Malada, but I refused to hand over the Ayleid carving. I must escape and return the carving to Umbacano in the Imperial City. 70 I was ambushed by Claude Maric outside of Malada. He forced me to hand over the Ayleid carving. I should return to the Imperial City and find out how much Umbacano knew about this. 76 I took back the carving from Claude Maric. Now to deliver it to Umbacano. 80 Umbacano thanked me for attempting to recover the carving, but has already paid Claude Maric for completing the task. It is possible to use the console to advance through the quest by entering setstage MS22 stage, where stage is the number of the stage you wish to complete. It is not possible to un-complete (i.e. go back) quest stages. See SetStage for more information. This page was last modified on 5 August 2017, at 17:40.